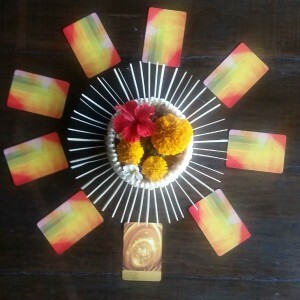 Radiance Retreat Bali was a fabulous retreat with an eclectic gathering of women who were there for each other, wanted to have fun, feel good, learn, shift , laugh, discover and get their glow on. 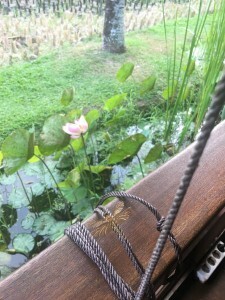 Here a few happy snaps…The view from our yoga bale and on our very first day of retreat the water lillies + lotus flowers bloomed plus the sacred mountain presented herself every day. This usually doesn’t happen until later into the retreat or even to the last day. When the mountain appears I have always believed the gods and goddesses are supporting my work. With all my work I listen to what mother nature is presenting and bring this into the retreat. With so many moments of synchronicity… the stars, planets, hearts & souls aligned for a truly transformative retreat experience. Our favourite cafe! Since I’ve been detoxing from social media I kind of forgot to take photos! 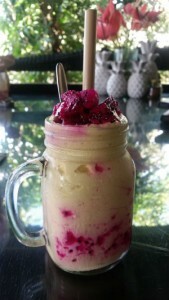 So this delicious Mango + Dragonfruit Smoothie is my only foodie shot! Yum! Totally to live for! The middle photo is of a gold dragonfly that appeared just as Trudy (aka Dragonfly) began to teach her class. The retreat was called Radiance Retreat and the colour of radiance is ‘gold’. So our golden dragonfly (I believe only the elders are gold was to live in the moment, find our gold and to let our radiance shine bright. I keep a notebook of ‘ moments of synchronicity’ to remind me of the signs + presence of my divine helpers. As I re-read my book I found a note from 2017 that I’d written after asking for guidance about hosting another Bali Retreat when a red + blue dragonfly landed on my table. Synchronicity + signs were telling me it was time to plan. The presence of the golden dragonfly confirmed that I am doing my soul’s work. 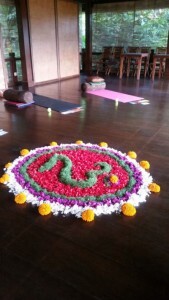 My beautiful friend Ketut (no not that Ketut) created mandalas for our yoga bale. This is the Bali Om which created such a beautiful energy for us to practice in. Balinese just know how to make things look beautiful. We enjoyed a sound healing in this sacred space. 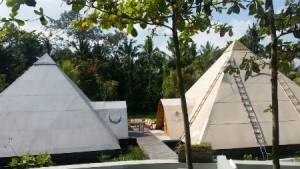 Two purpose built pyramids dedicated to the power of sound healing. We will be going next year as everyone loved it so much and received so much clearing, healing and insight. 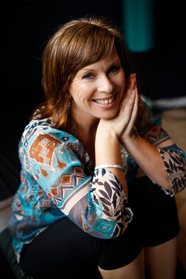 Trudy and I have been hosting our retreat together for nearly 9 years and I couldn’t do it without her. A Feminine Spirit Retreat is never just a ‘yoga retreat’ because we bring so much more to it than that. 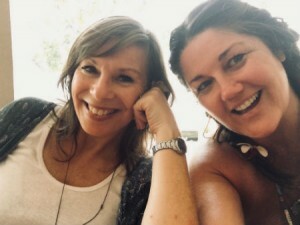 I bring the energetic healing, spirituality, reiki, yoga, intuition + wisdom and Trudy brings the fun, laughter, sisterhood and her wisdom, passion + skill with our Bali Glow makeovers + a spontaneous shopping trip for that new look! All of them separately work but it’s when you bring them all together that is when magic is created! 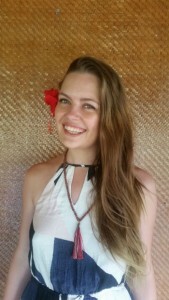 And without further ado presenting the 2018 Bali Goddess’s..
After our Bali Glow we enjoy a cocktail or two and a delicious dinner in town. I realized the powerful benefits of small group work this year ~ it was intimate,personal, supportive and the transformations were deeper because there was focus given to each person. With each guided relaxation I would Reiki the goddesses and write their insight down on their own ‘oracle card’… it was amazing how these insights linked into our colour oracle cards, the yoga and the theme of the day. If I had 10 – 18 people I couldn’t have done this. So we’ve decided to limit our numbers to 8 … So if a Bali sojourn speaks to you … click on the link so you can save the date for ~ Sacred Beauty Bali Retreat 2019. Last but not least. 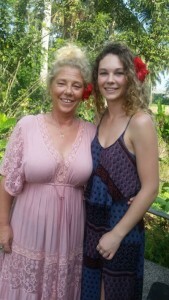 Thank You Bali… you allow me to be who I am and to do what I am here to do and that is to teach and learn. To my soul sister DragonFly. To the goddesses who trust with their feminine spirits. We are forever humbled. I really enjoyed the feminine spirit retreat, it was a personal first for me in many ways, I was so grateful to have this opportunity. 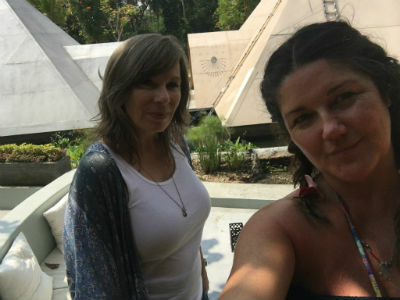 Susanne and Trudy shared some amazing things with us and I felt very connected to our beautiful group of women and blessed to be part of this experience. 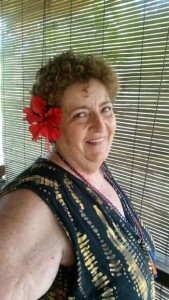 I enjoyed getting my daily insights from Susanne they were wonderful. I learnt that it was okay to invest in me and enjoyed the visit to different spas for the massages and facials. 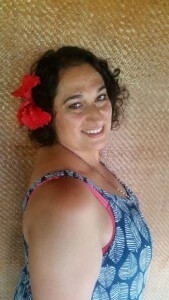 I loved every aspect of this retreat it gave me the rejuvenated glow that I so needed. All the work Susanne and Trudy put into this retreat was shown with such love and care for all of us. I loved that we finished off the retreat by receiving a goddess glow make over and also creating a vision board as my vision for what I wanted for myself became clear as the days on the retreat unfolded. I only wish I had more time in Bali afterwards it’s such a beautiful place with. Beautiful people. 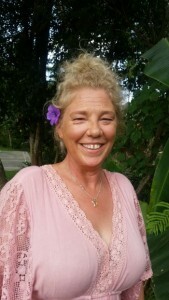 I felt very spiritually connected and centred in Ubud.